I’ve waited nearly nine years to hop off my boat into warm water, and on our second stop in Mexico when the temp gauge said the water was 80 degrees it was definitely time to do just that. And it was very very good. 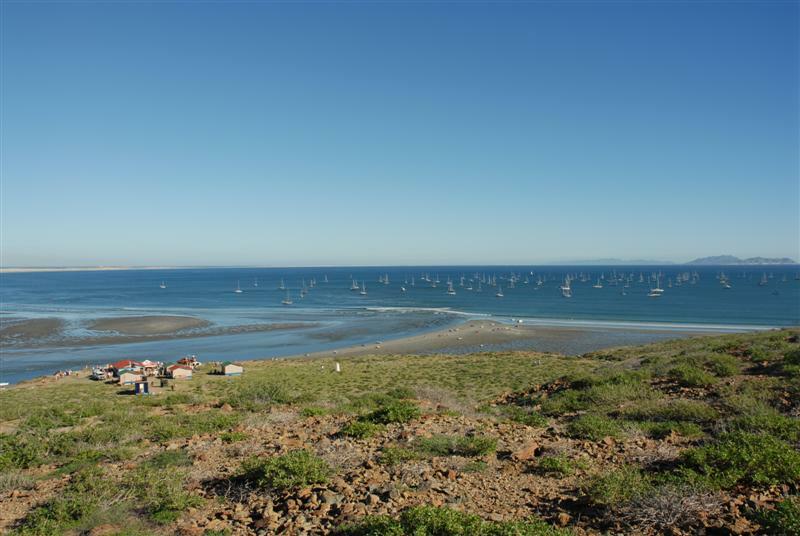 We were in Bahia Santa Maria, about 3/4 of the way down the outside of the Baja peninsula, along with 162 other boats headed to Mexico for the winter. The Baja-Haha was living up to its reputation of providing lots of new folks to meet and good beach parties. 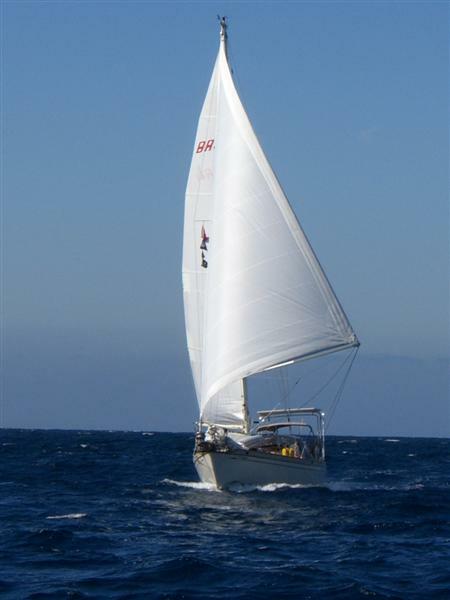 We had our friends Lee & Kathleen from our cruising club in Seattle onboard as crew for the Haha. 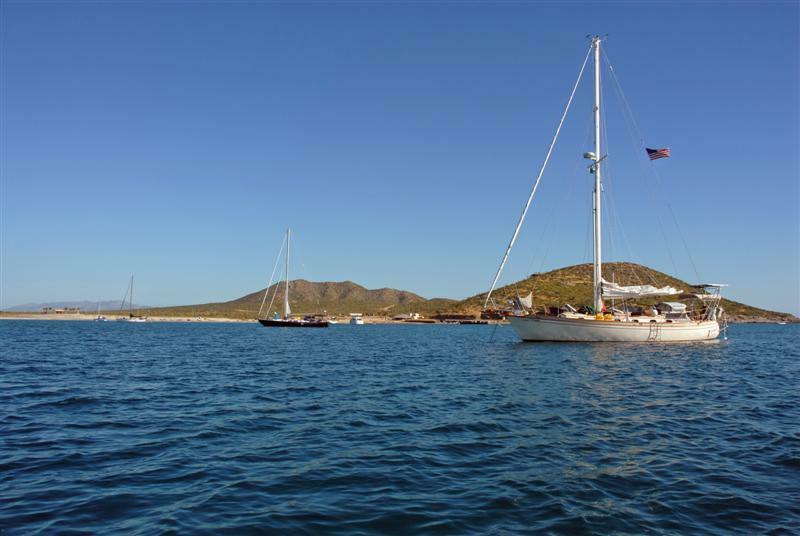 It was nearly a two week trip with 6 overnight passages and two stops between San Diego and Cabo San Lucas. Unfortunately we’re into the light air passages Mexico is famous for now, so we didn’t sail the whole course. As we got further and further south from San Diego, enough good wind to push our 34,000 pound boat was impossible to find consistently. But we definitely had fun trying. And I can totally admit that Lee & Kathleen could generate food out of my galley that tasted better than anything I could ever conjure up. The day they caught a mahi-mahi and served it lightly pan fried on a bed of coleslaw I thought I was eating in the best restaurant on the planet. Hopefully I learned a thing or two while they were here. I do know that getting a massage (Kathleen is a professional massage therapist) on the midnight watch was a treat I’ll remember for a long long time. Now the Haha is over and we’re working our way north to La Paz for Thanksgiving. We were going to go over to Mazatlan, but hurricane Sergio is hanging out down near Zihuat, close enough to Mazatlan to just make us nervous. It seemed more prudent to head in the opposite direction, rather than towards it. And we’ve got a few boats with friends from Seattle that left last year that are further north that we’re anxious to catch up with. After Thanksgiving we’ll cross over to the mainland and work our way south, getting to Zihuatanejo by Christmas for Leslie & Fred’s vacation. Today on Yohelah we’re relaxing in the shade of the cockpit after another nice swim this morning……..